The week before a craft show is full of crazy. Even though I prepped and planned a whole lot earlier than I would normally do, it’s still causing me stress. New designs, new products, a cute new garland for my table, it’s a whole lot of work. If you’re local and in Vancouver, please stop by my table at Got Craft this weekend and say hello (I’d love to hear from you!) – there’s a last minute venue change due to a fire but you can find all the latest details on their website. One thing that usually goes out the window when I’m busy is eating well. This week I haven’t ordered take out or stuffed my face full of stress chips. Okay, that’s a lie. Yesterday my entire diet consisted of: 2 coffees, 1 bowl of cereal and 2 hot dogs. But ignore that because the rest of the week I was eating food that I was proud of. Besides that one slip up, I’ve been diligent in making fresh meals and by far my favourite meal of the week was this colourful chopped salad. I mean just look at it!! It’s so fresh and full of colour, texture and flavours! I was lucky to have recently roasted up some beets & cooked up some dry chickpeas, so that provided the basis for my salad. A nub of purple cabbage ready to shred, a large carrot grated, celery, cucumbers, green onions, red peppers, feathery fresh dill, mozzarella, and salami completed the dish. Oh, and there’s romaine lettuce too! I didn’t want to pile all of these ingredients over top the lettuce, especially since I knew we’d be eating this meal as leftovers the next day and I didn’t want to discover a soggy situation. Instead, I pretended I was one of those food bloggers who actually puts serious thought into presentation and went with it, arranging everything onto a large platter so that it was a feast for the eyeballs as well as the belly. Not bad! 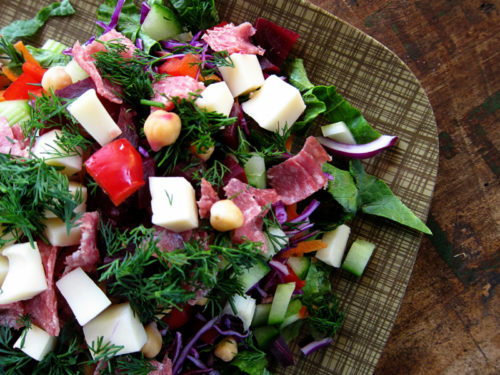 I had never had salami in a salad before and I was pretty smitten with it. For me, the roasted beets were a must, as were the chickpeas and fresh dill. But don’t worry about the ingredients because this dish is incredibly flexible. Want it vegan? No problem – just add tofu, grains and shredded vegan cheese! Want a different twist? Add cooled quinoa, grape tomatoes, shredded roasted chicken, and torn basil leaves. Get creative with your ingredients! I went with a simple balsamic dressing and it went beautifully with the flavours. This is the kind of salad to serve at a casual dinner party. It’s funny because there are fondue parties, pizza parties and sundae parties, but I never hear about salad parties. I’m sure going to a salad party wouldn’t appeal to everyone, but really, why not? A salad doesn’t have to be boring. This should be the kind of un-boring salad for that kind of party! Beautiful ingredients composed on a large platter where guests can choose which ingredients to put on their plate. Protein, crunchy vegetables, fresh herbs – everything is represented here! Have some crusty bread and red wine and I think we could start a trend! 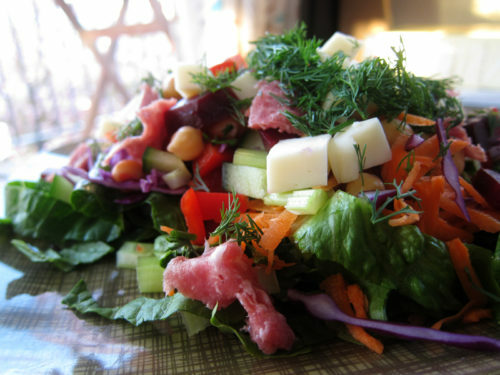 Salad parties, it’s the new big thing for spring 2013…well, I’ll throw one and see how it goes. Hello, salad party!! I’m leaving the amounts of everything flexible, as this can serve 2 or a gathering of friends. Be playful with your ingredients – read the above post for ideas, or try my version below. The vinaigrette can be doubled or tripled as needed. Place lettuce in a large serving bowl and set aside. Arrange the remaining ingredients, except the dill, on a large platter. Use colour as a guide to come up with a pleasing visual arrangement. Place dill in a small bowl. Shake dressing ingredients in a small jar. Taste & adjust seasonings, if needed. To serve, layer a plate with lettuce and top with platter ingredients. Scatter everything with dill and dress with vinaigrette as needed. nom nom! this looks great. 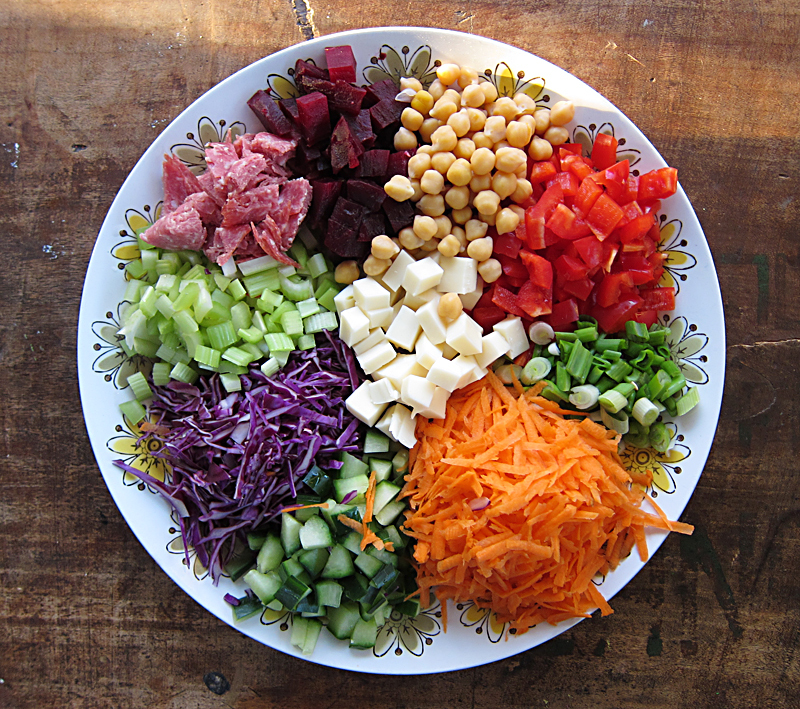 I need more salads like this in my life- I always get so bored…and then feel guilty for not eating enough salad. This is gorgeous!! Good for you for sticking to a healthy diet (mostly :)) during a stressful time. That’s always when I have trouble, too. Best of luck at your craft show! Wish I lived closer and could stop by! And YES to salad parties. Excellent idea. Seriously, about 5 or 6 years ago I RSVP’d to a “vegan salad party” on meetup.com or some such site, and never looked back! I met a bunch of great people that night, and I still remain friends with the organizer. She continued to hold sporadic potlucks for a few years after that; they’re on hiatus at the moment, sadly, but DAMN were they fun (and tasty)! Looks amazing! My friends and I definitely have salad parties. We have pot lucks a couple times a year and we each bring a different salad. It is a great time! Having this huge platter of deliciousness on hand would definitely convince me to eat well and avoid the bad snacking!! Good luck at the craft show! That salad looks almost as good as I bet it tasted. Except for me the beets have to go – hate them with a passion no matter how they’re cooked. This has actually worked to my advantage, being diabetic I wouldn’t be able to eat them that much anyway. The colors on your salad are so vivid and beautiful that even without the beets this is going to be a winner for bbq’s this summer. Thanks for posting it. I’m so mesmerized by the awesome colour wheel of veggies!!! Such a fantastic idea to host a salad party. If it hasn’t already, I have a feeling it may just become the next best thing. 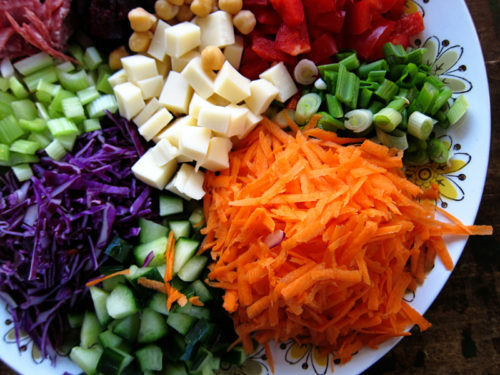 If I were invited to a salad party I wouldn’t hesitate to attend…yum!! Oh my, the colors in that salad. Beautiful! What a terrific idea. Hope all goes well at the craft show! This is such a good idea, especially for those days when you can’t really commit to cooking. There’s still delicious dinner for all! And salami in a salad does sound like a perfect plan. 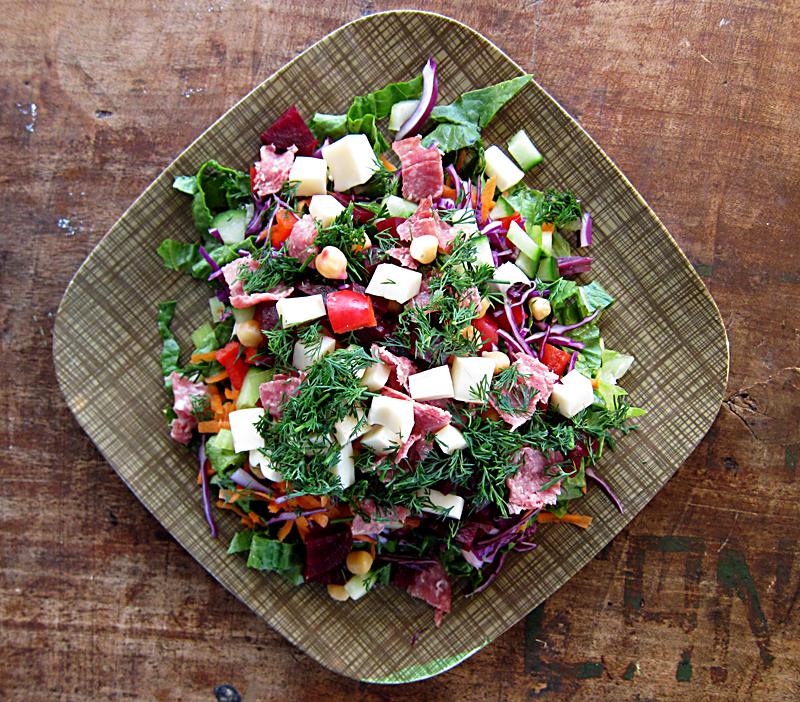 Salads like these make it easy to eat the rainbow of nutrients and vitamins. I love salad and don’t really feel like I’ve eaten properly without a salad on the side. 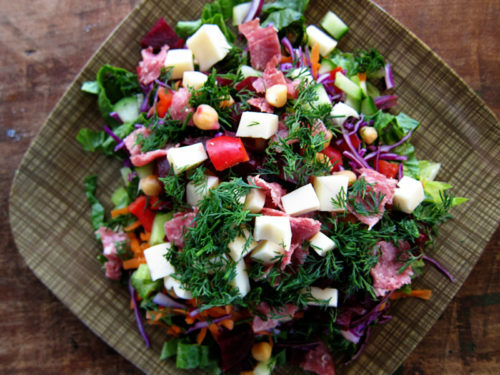 That salad looks wonderful! I’m so proud of you for being busy but still making it a priority to eat well. I know its hard to do. I have to focus so hard on buying fresh and preparing good for us meals when times are stressed, but it is so worth it. Hope your craft fair was a success! Thank you all for your kind messages, your thumbs up to salad parties and good thoughts! THANK YOU!!! !